Once the ancient capital of the Chand Raj kings who ruled in the 7th and 8th centuries Binsar is an epitome of solitude, quietness and natural beauty for today's traveler. Perched on top of Jhandi Dhar hills, Binsar is 35 km from Almora and is a notified forest reserve and bird sanctuary. There is no town called Binsar, not even a settlement of huts or anything, it is just the forest reserve that has been named Binsar. The placed affords wondeful views of the snowcapped Himalayan ranges, like the peaks of Nanada Devi, Kedarnath, Chaukhamba, Trishul, Panchchuli and Nanda Kot. Climate : Cold in winter, snow Dec-Feb. Cool in summer. Clothing : Heavy woolens in winter, light in summer nights, none during noon. Use high boots if you want to roam around in the jungle. Train Last station is Kathgodam 120 km from Binsar. Binsar is famous for it's views of the snow capped Himalayan mountain ranges, so one can sit back and enjoy the view while savouring your favourite drink. One can also go trekking with abundant nature trails available from Binsar. Binsar also houses a forest reserve with a rich diversity of flora and fauna with forests of oak and rhododendron with a large species of flowers and birds along with some wild animals. The famous temple of Binsar Mahadev is also nearby.One can also make a detour to nearby places like to Kausani, Ranikhet, Jageshwar or Chowkori. 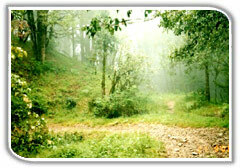 km from Almora and is a notified forest reserve and bird sanctuary. There is no town called Binsar, not even a settlement of huts or anything, it is just the forest reserve that has been named Binsar. The placed affords wondeful views of the snowcapped Himalayan ranges, like the peaks of Nanada Devi, Kedarnath, Chaukhamba, Trishul, Panchchuli and Nanda Kot. Binsar is famous for it's views of the snow capped Himalayan mountain ranges, so one can sit back and enjoy the view while savouring your favourite drink. 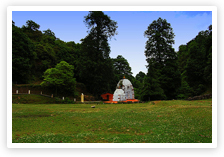 One can also go trekking with abundant nature trails available from Binsar. Binsar also houses a forest reserve with a rich diversity of flora and fauna with forests of oak and rhododendron with a large species of flowers and birds along with some wild animals. The famous temple of Binsar Mahadev is also nearby.One can also make a detour to nearby places like to Kausani, Jageshwar or Chowkori. Based in 25 acres of virgin forests Of Binsar Reserve the resort was established in 1875 by Sir Henry Ramsay, a Britisher who settled here after his service. The place mesmerized the Nehru family and they spent some memorable time here. The Resort has eight two bedroom cottages with attached bath and running water. The resort serves only vegetarian food because of it's location inside the forest reserve. For recreation there is table tennis, badminton, billiards & tennis. One can also stroll through 25 acres of the Khalli estate and take in the beautiful scenery and green surroundings. Conference facilities are available for upto 50 persons.